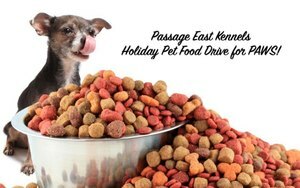 'Tis the season for giving, so help us lend a paw during our holiday pet food and supply drive to benefit PAWS (Pet Animal Welfare Society) of Norwalk! Two Ridgefield businesses, JoyRide, located at 62 Danbury Road, and Serene Escape Spa, located at 415 Main Street, are both collection hubs for this important fundraiser. Please stop by either of these local businesses to make your donation. If you want to play Santa Paws this year, we encourage you to stop by Passage Eas Kennels at 499 Danbury Road in Wilton during our open hours with anything you can spare! Thanks to our friends at Serene Escape Spa, you can also conveniently make donations at their downtown Ridgefield location at 415 Main Street, behind Planet Pizza. Everything you donate feeds a local dog or cat in need and helps offset shelter operating costs. You can also donate online at www.pawsct.org. PAWS is a 501(c)(3) non-profit no-kill shelter that rescues and re-homes approximately 100 dogs and 500 cats annually. Many of the dogs faced euthanasia at local pounds and most of the cats that are strays or abandoned. In order to continue providing their excellent critical medical, emotional, and social care to these animals, and ultimately find their forever homes, PAWS relies on the help of animal lovers like you!